Another post on Getting Along with Others is forthcoming. Before I post, I wanted to upload this reminder from the recent post RELATIONSHIP: We CAN Get Along just to keep a concept fresh in our mind as we journey to the next conversation about practical tips on what we can actually DO to experience the shift in our relationships. I decided to upload the 3 points below because, like the last entry on Fear, these are constant little reminders I keep in my head as I operate out in the world. 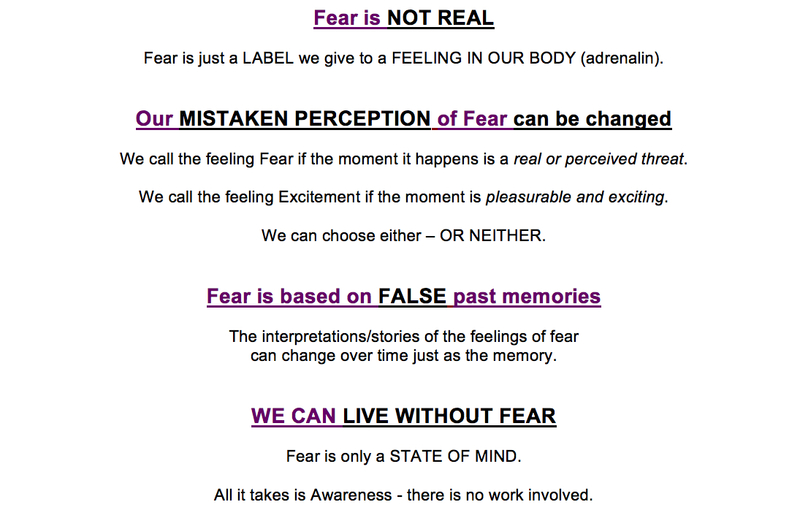 Here’s a downloadable graphic of FEAR if you’d like to have a reminder. I don’t know, lol. When I tell someone it is possible to live life with Freedom from Fear, an interesting look comes over their face. They twist their mouth and raise an eyebrow as if to say, “Yeah, sure … right – like I’m afraid”. In this post, I will share with you some of my insights that can lead to possibilities to actually do what many of us see as impossible: Living Without Fear. I’ll include a couple of examples to make the point (so, I hope it doesn’t get too long). we call the feeling Excitement if the moment is pleasurable and exciting. We can pick and choose either – OR NEITHER. The interpretations of the feelings of fear can change over time just as the memory. Fear is only a STATE OF MIND. There is no work involved. It changes our life beyond anything we could imagine. While the changes are subtle at first, over time we begin to see a fantastic shift in our lives. We not only transform our experience of life by the way we approach the outside world (and the colourful mosaic of individual differences), but the internal personal experience of our essence becomes magical because we have a better understanding of ourselves. We no longer have to live the feelings of having to do things for all the wrong reasons. Once we peel away the layers of excuses we make up about NOT doing things we really want to do, we then realize the deep-seated fears that rule our lives rear their ugly head and expose themselves for what they are: Just a feeling I am mistakenly labelling fear! Consider this: Compare what we do for ourself personally and what we do with our money – and see if you take the same care. With our money, we know we are taking risk regardless of what we are doing with it (even spending it). When we make large financial decisions, we feel the adrenalin rush and it gets us a little excited (or scared as heck, lol). After all, we are taking risk. But what we do next (if we are doing our due diligence), we do our research and maybe hire an expert for advice. As we become more confident with information, the thought about our bodily feeling changes as the adrenalin rush (or the memory of it) dissapates. This is what happens: As we get to the bottom of information and strip away the perceived risks (that challenge our fears), we realize we can make well-founded decisions with confidence instead of fear. We experience no more feelings of inadequacy. We can pursue hobbies, career directions, activities, and opportunities we truly enjoy and are good at performing because it truly lights us up – WE CAN’T FEEL BAD – it’s impossible because we enjoy what we are doing. For example: Instead of hiding your tiny art studio and work in your basement corner as a dirty little secret, you can take a risk (lol) and decide to show it publicly. You decide to show at the local community centre; and lo and behold, someone actually makes an offer on a piece. Another person invites you to show at the local artisan show. Once there, you then get another buyer for a piece and you meet 3 great people to chum around with and talk art. This is what happens: Getting outside your head and shell, you finally express yourself and experience the rush of just having someone look at and appreciate your art work. The sales are bonus, and the new art friends are invaluable and allows you to stretch your imagination and boundaries. Other people in our lives become more interesting and alive. Because we know people live with their fears (just as we do ourselves), we can be more understanding and compassionate towards them. Conversations become easier to have with strangers because we know they are behaving out of their fears. For example: A young man stands in the corner alone at a community social. You see him and imagine his possible fears (as well as the look on his face) and given the knowledge you now have about people and their fears, you can understand that he is so gripped with his fear within themselves, he cannot even talk to someone. Maybe he doesn’t want to sound silly, or say something wrong, or appear aloof. Sounds like a number of different possible fears, huh? And he feels like that just like we’ve all been at one time or another. You realize he could probably use a friend right now. This is what happens: After speaking with the young man, you find out he is a fledgling artist and lives with his sick grandmother. He can’t go out much, so he is house-bound as well. You realize you know someone who could use an artist to do some web design. You link them up; and some months later, you find out he is able to get homecare assistance for his grandmother and is now enrolled at art school to take a program on web design – something he always wanted to do. It goes without saying that there are some downsides to this new way of thinking and being. But these are usually temporary and the best thing that ever happened to us (in hindsight). 1 – People are going to see a change in us right away >> and they may not like it. They were used to us cowering, or fighting back, or screaming, or crying. Certainly not someone more confident and relaxed. You are not reacting any more. And deep down, they know the fear is gone – and that changes everything. Then we quickly see them show true colours or their true expression of their own fears. 2 – Another thing to notice as we release Fear in our life is that we may take Risk less seriously. Risk is what makes the world go ‘round, but that doesn’t mean we could just throw away caution to the wind. Some fears are real and require the proper investigation before taking action. is probably the reason why we have people do reckless and dangerous things (especially among young people). And again, it is not always apparent – but I have deep and strong suspicions. I believe it happens immediately and ends up sinking deeply inside our memories. Someone may drive home drunk one night and is scared of getting caught. After a couple of times (and it doesn’t take long to imprint the memory) of not getting caught despite the feeling of fear, s/he decides (for some reason) that it is actually exciting to be breaking the law and not get caught. After a few more times, the excitement causes him/her to take more and more in order to re-create the feeling again. The progression of risk keeps getting higher and becomes a habit until something tragic happens. Someone is living in debt and is scared of losing everything. Deciding on fixing the problem by going to the Casino, s/he is getting an incredible feeling of the adrenalin activated because of the risk. Once inside and gambling, the feeling gets stronger as you maintain hope of escaping the fear of poverty. Then s/he wins a couple, and all of a sudden, the feelings of joy are connected with winning – and boy does it feel good. Eventually, the risk associated with the feeling is exciting and escalating and we want to re-live it again and again – so regardless of the outcome at the end of the night, if strong enough, the new feeling of excitement compels him/her to come back until something tragic happens. In the next post on Fear, I will offer some suggestions on what we can actually DO to change the paradigm of running away and actually take action in our lives so we can “laugh in the face of fear”. another cold body, another lost fight. blood pools from his brain – left undisturbed. of someone nearby, invading his space. there lies a body – making no sound. ‘left for the taking’, that’s all he knew. his raw heart races – his body shakes. he sees no movement; he sees no breath. and blue glassy eyes – they only stare. then inspects the body from head to toe. steals the man’s wallet – and runs like a rocket! Getting along with others in the world is probably the most difficult thing that confronts us each and every single day. For some of us, it has gotten easier over the years as we learned some little trick to help make life easier. For many of us, it is still difficult being in relationship with others. We may have an inkling of how things can be done differently, and some of them we use. Still, for others, life continues to be just a string of confrontations and problems that seem to keep popping up and never going away. Fortunately, there is hope and possibility that this can change for the better – regardless of where we fit in the above situations. It is possible that all our relationships, from lovers to strangers, can be without the conflict that easily shows up. By simply changing the way we see others and ourselves, it is a SURE THING to TRANSFORM your life experiences and relationships by just having better understanding of how we operate as individuals. disempowerment, and/or resentment, and/or unfinished business. For this post, I am bringing the conversation full circle by sharing with you my assumptions and successes that give validation to this very incredible assertion. Here, we will look at what we can do about the never-ending conflict that surrounds us all. I am going to make a few assumptions about getting along and how we can live with less conflict towards a more personally freeing experiences we all seek in our lives. when understanding and (re)building relationships. From all of the evidence around us (politicians, criminals, armies, activists, and others), it appears we still have limited knowledge when it come to relating with each other. Strong and the leadership type. A take-charge person with family matters and is action-oriented. When the fear is threatened from an issue, tend to seek at least one ally in the family for support. Will always be right. PAYBACK: Will always have a close connection with ‘family’ throughout whole life. Does not raise issues and has few friends. When the fear is threatened from an issue, may often tell supervisors what is going. PAYBACK: Better feeling of security and feels a bit of power. Docile and expressive with emotions. Usually go along without sharing concerns. When the fear is threatened from an issue, may involve pouting and whining, usually from a ‘victim’ position. PAYBACK: Never give others a reason to leave, and will always have someone by their side. Usually happy and fun to be around. Reliable and a team player. When the fear is threatened from an issue, may get loud and boisterous sometimes leading to escalate issues. Usually knowledge of personal details of friends that keeps a connection. PAYBACK: Will be acknowledged as a respected, liked, and a trusted friend. Always have someone to turn to in times of need. Untrusting and avoid eye contact. When the fear is threatened from an issue, may walk/run away or yell/scream loudly. PAYBACK: Get validation for fears about other people from other people. When considering these character traits, keep in mind that it is even possible for all of these fears to the emotional make-up of only one person. It’s possible because we understand these kind of issues, and we can relate to them – if not in ourselves, we can see them in others (just as others would see it in us) . for why they act that way. we often don’t even know it when we do it to ourselves. So, Why Don’t These Methods Work? In each of the people above, the pain of issues will never go away, because the real issues are not addressed. They allow the opening for more opportunities for problems and issues to arise because they will still not feel better or closer to other people. First: The fears still exists – it/they have only been defended (temporarily for that instance of the fear). Because we are dealing with “what happened or is happening”, we overlook the real source of the fear. For example, maybe Sue (from above character) was born into poverty even though father was a union-man. She witnessed a lot of violence in the workplace and came to believe management were people to fear. She developed her behaviour from the trauma in childhood and did not want to be poor again. we humans are all more alike than we realize: we all live and hide inside our fears we developed early on in life. Second: The current methods only maintains or increases the distance we have when relating with others. When we look at Bob or Ann, they may rid themselves of the immediate issue/threat (real or perceived) by their actions; but over the long run in their lives, they will always struggle with how they operate to get what they want. The major problem arises from the years of practice we collect to let it imprint on our memories from all our past issues. And when we look back on our lives (and be honest with ourselves), we can see links in EVERYTHING. We can’t help what we are doing because our habits are deep-rooted. For example, say I had an issue (fear) with feeling like people are always putting me down. I could react by arguing with people to make a point (as truth), or maybe become a loner, or by having friends below my perceived level. I may get those feelings from way back in my childhood from, say, a mother that was always putting me down and saying I was stupid, or I lived in a community that I knew was full of poverty. based on OUR private fears we hold from long-held, unresolved traumatic instances. THIS IS THE SAME FOR ME – AS IT IS FOR YOU – AS IT IS FOR EVERY LIVING BEING. is affected by fear in some way or another. For the most part, we aren’t even aware how our relationships are affected so much. And none of us are immune to the ravages of fear because regardless of whether the fear is real or imagined, the world relies heavily on our exposure to fear and promotes it always. We just plain cannot escape it as sure as the sun always being there. are taught to us without even being aware of it! As we know, we are taught in life to be a certain way in specific situations. All of our influences come from many sources: media, entertainment, family, friends, professional associates, financial status, etc. We are most influenced by our primary relationships: family. when we are protecting ourselves in conflict. “We are all THE SAME. BEFORE IT HAS A CHANCE TO HAPPEN? ALL OF A SUDDEN A MIND-BLOWING SHIFT IN YOUR LIFE TAKES PLACE. Yes, an INCREDIBLE TRANSFORMATION (NOT change) of how you look at people, see people, interact with people, and get interested in people. YES! DID YOU KNOW: When you walk along the street and you are smiling, people are almost certain to smile back at you when you make eye contact. Try it out sometimes. Next post on relationships, we will look at some examples of how fear rears it’s ugly head.